The exhibition industry makes a major contribution to the development of other industries by facilitating the exchanges of people, goods and information. At the same time it produces spillover effects on the local and regional economies by enhancing their information transmission capacity for local resources and buying power, and by leading to the creation of new businesses. Many of Japan’s industries have entered a mature phase and are faced with the situation where further domestic demand growth is hard to expect. The nation needs to actively attract external demand from overseas countries, particularly Asian nations which are growing rapidly, and to stimulate corporate transactions both in and outside Japan. In the past various statistics within Japan’s exhibition industry have been unclear, the standards for such statistics have been inconsistent, and comprehensive data pertaining to the actual exhibition results were inadequate. Recognizing this problem, the Japanese Ministry of Economy, Trade and Industry (METI), has taken steps aimed at improving statistical data and enhancing the exhibition industry. These steps included carrying out a survey project in 2010 to establish standards for exhibitions, undertaking a project in 2011 to framework the Authorization System for Exhibitions, and launching the authorization system in 2012. To consolidate exhibition statistics with high reliability and transparency by introducing the Authorization System for Exhibition Statistics. To unify the definitions related to the exhibition industry and the indicators for the industry’s statistical data and to establish the standards for the exhibition statistics. As a general rule, the more that world markets expand and become globalized, the stronger the demand for international exhibitions becomes. Keeping this fact in mind, in order for Japan’s exhibition industry to cast off its reclusiveness and become more international in nature, and to obtain the assurance that the exhibitions held in Japan are held with transparency, reliability, and quality, it is necessary to consolidate the statistics about the numbers of visitors and exhibitors, etc., comparable with the world statistics. Since only consolidating these statistics enable us to obtain exhibitors and visitors alike with higher quality, we believe it is very meaningful to move ahead on the Authorization System for Exhibition Statistics. Exhibition organizers are expected to make effective use of this authorization system. Introducing the Authorization System for Exhibition Statistics, we believe, will facilitate the preparation of the exhibition-related statistics and will enable us to evaluate the economic spillover effects. In addition, it will be possible to analyze the current situation, trends, and the international advantages of Japan’s exhibition industry, and we will be able to formulate medium- and long-term strategies based upon such analyses. Moreover, it can be expected that the Authorization System for Exhibition Statistics will strengthen the reliability and transparency of Japan’s exhibition industry, stimulate the participations or visits from both inside and outside of Japan, and drive the internationalization and vitalization of Japan’s exhibition industry and, eventually, of the Japanese industries as a whole. The Authorization System for Exhibition Statistics is the system to authorize those exhibitions to which the exhibition statistical data, such as the number of visitors or visits, the number of exhibitors, and the exhibition areas, are applied based upon the definitions and indicators determined in the guideline of the Authorization System for Exhibition Statistics. * Those exhibition organizers who want their exhibitions to be authorized must submit their exhibition statistical data based on the definitions and indicators determined in the guideline of the Authorization System for Exhibition Statistics. The Authorization System for Exhibition Statistics is applied only to those exhibitions that have been put forward for authorization by the organizers. In addition, the statistical data is collected only from the exhibitions which use counting methods that comply with the international standards. Other matters are based on ISO standards. More than 5% of the total number of visitors or more than 10% of the total number of exhibitors must be from overseas. Flea markets, sidewalk sales, etc. “Main exhibitors” mean those exhibitors who contract directly with the exhibition organizer. “Co-exhibitors” mean those exhibitors who exhibit their products/services in another exhibitor’s exhibition booth. Co-exhibitors must always elucidate its name and address. “Group exhibitions” mean those exhibitions where a main exhibitor rents the exhibition space and a number of co-exhibitors share the space. The nationality of an exhibitor is determined according to the address declared by the exhibitor to the exhibition organizer. “Overseas exhibitors” mean those exhibitors whose addresses declared to the exhibition organizer are overseas. An overseas company’s local subsidiary in Japan who contracts with an exhibition organizer should be categorized as a domestic exhibitor. “Visitors” mean those people who visit exhibitions with the purposes of collecting information, purchasing products, and contracting with exhibitors; however, exhibition organizers, exhibitors, newspersons, and service providers related to exhibitions are not counted as “visitors.” Speakers are counted as “visitors” only when they visit exhibitions with the above-mentioned purpose. The nationality of a visitor is determined according to the address declared by the visitor to the exhibition organizer. “Overseas visitors” mean those visitors whose addresses declared to the exhibition organizer are overseas. An overseas company’s local staff in Japan who visits exhibitions should be categorized as a domestic visitor. “Size of exhibition space” means the total of the space the exhibitor rents from the exhibition organizer, either with or without charge, and the space used by the exhibition organizer or exhibition secretariat for exhibiting directly related to the subject of the exhibition. Note: We follow the definitions of the terms related to the exhibition statistics determined in the METI 2010 Survey Project about the Environmental Improvement of Japan’s Service Industries (the Survey Project about Establishing the Standards for Vitalization of the Japanese Exhibition Industry and Formulating the Visions). However, they can be revised, if necessary, through the consultations by the related persons. The fee for the Authorization System for Exhibition Statistics is 300,000 Japanese yen per one exhibition. The exhibitions authorized through the Authorization System for Exhibition Statistics are given the Authorization Mark, whose image is shown below. Exhibition organizers can apply for the authorization for exhibition statistics. 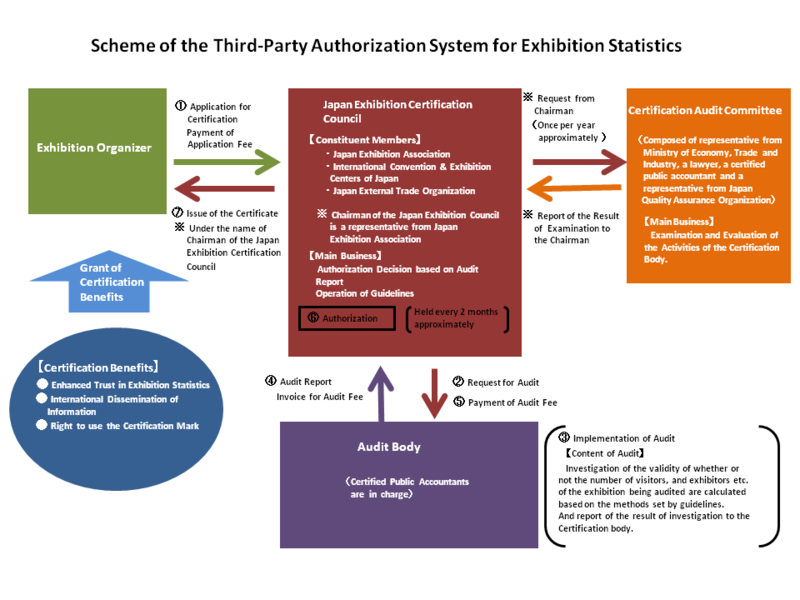 The authorization body (Japan Exhibition Certification Council) serves as the “reception desk” to accept the exhibition organizers’ applications and as the overall secretariat function for the Authorization System for Exhibition Statistics including requesting the investigative body to make a necessary investigation. The authorization body also conducts a review for authorization for exhibition statistics based on the reports submitted by the investigative body. The investigative body makes an investigation, based on the authorization body’s request, for the exhibitions for which the authorization applications were submitted about whether the various statistical data submitted by the investigative body are complied with the definitions and rules determined in the guideline. Certification Audit Committee conducts, based on the request by the authorization body’s chairperson, a review about once a year and check whether the Authorization System for Exhibition Statistics is managed fairly and properly.